Not many people come here. Even for the tourist this is a long way out of your way. But it is worth the effort to get here. My starting point for considering the relationship of simulation to both electronic games and the writing classroom is, paradoxically, that the applicability of the term to both domains is highly contested. Some game scholars (Frasca, 2003; Bogost, 2006) have discussed simulation as a broad category that defines a particular way of engaging with both material reality and the lifeworld of the player. 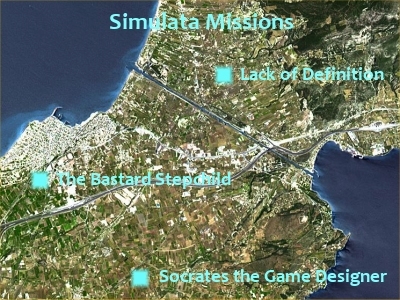 Most gamers, game designers, and reviewers, however, define simulation according to very narrow content and gameplay criteria or refuse the term entirely. Similarly, the writing classroom is rarely discussed as a simulation space unless the term is used pejoratively as a factor that keeps meaningful learning at bay. Oddly enough, however, the writing class is also often seen as a failed simulation (without the word ever being used) when it does not do a good enough job training students in the behaviors necessary for participation in specific disciplines and the broader academic community. I make the case for why simulation is a key concept for understanding many species of electronic games and the writing classroom in the cities of Arpeggia and Pedagogia respectively. The intention in this section is rather different. I want both to define the nature of simulation and to identify why the term makes people so uncomfortable that they will deny its applicability to those areas where its use would be most beneficial. To that end, I focus on an instability in the term's etymology to highlight simulation's threat to move out of a secondary modelling of reality and into the creation of a reality from which we will not be able to stand apart. I also examine the way in which simulation's emphasis on behavioral modelling runs counter to traditions of narrative representation, realism and authenticity that inform both game design and the writing classroom.